The longtime Alley Cat proprietor moves on. Daisy Kimberly of West Tisbury clearly has a creative flair. 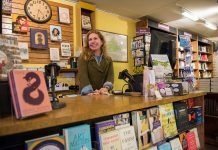 For years she expressed her artistic side both through the selections she made for her Alley Cat boutique in Vineyard Haven and in the marvelously inventive window displays that enchanted passersby on Main Street. Now, after 25 years of owning and operating the chic boutique, Ms. Kimberly has finally found the time to further explore her right-brain tendencies. 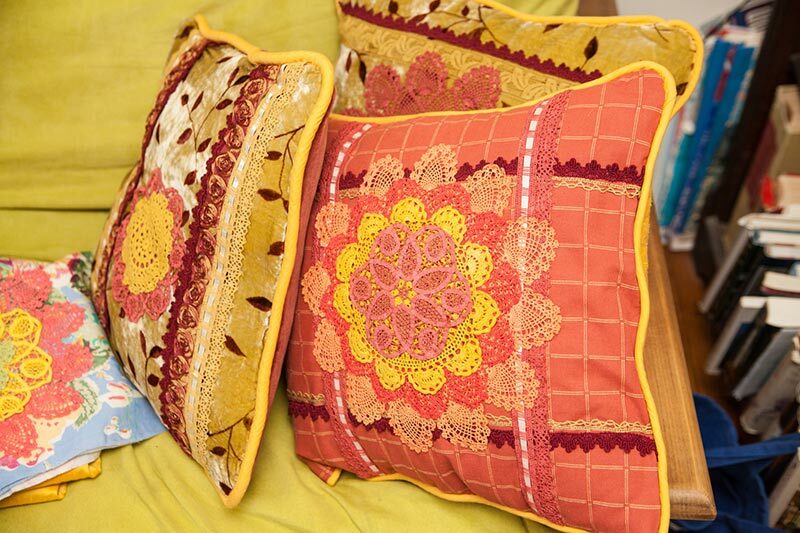 For the past year, she has been hand-stitching colorful accent pillows that incorporate luxurious fabrics, antique lace, ribbons, crochet, and other decorative elements. She debuted the collection at a trunk show at Sioux Eagle last fall, and then sold a sampling at the pop-up Christmas shop behind Alley’s. 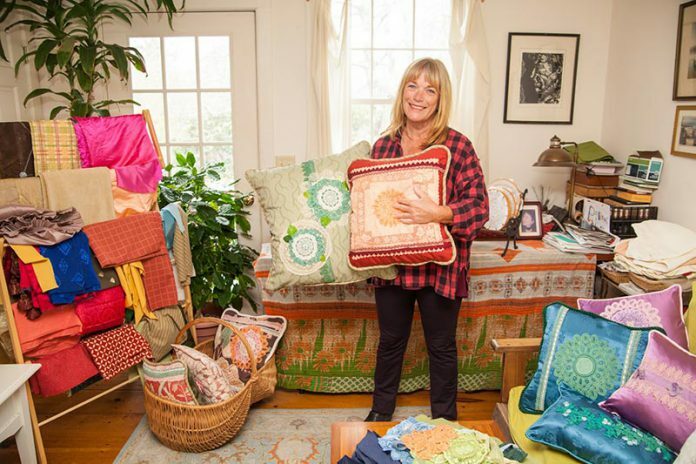 This summer, with a substantial inventory on hand, she will be selling the one-of-a-kind pillows at the Featherstone Flea Market. Ms. Kimberly has always had an interest in art. After leaving the retail business, she thought about dabbling in painting. 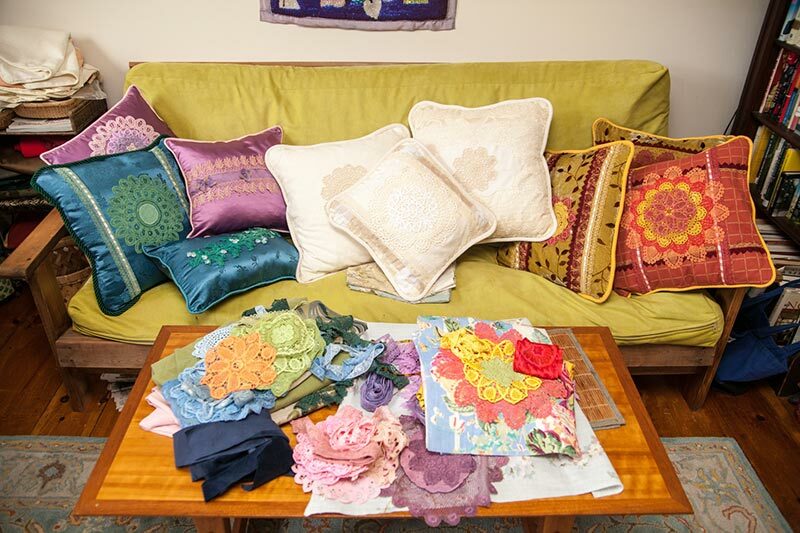 However, after making a couple of pillows for herself and friends, she discovered that she really enjoyed the process. Each creation truly is a work of art. Ms. Kimberly sometimes refers to her process as collaging. She pulls together all types of textile pieces, and creates a fully coordinated picture or design. At first glance, one might not distinguish all of the various elements, as they are cleverly interwoven and color-coordinated throughout the design, but careful inspection reveals meticulously sewn layers of ribbons, hand-dyed lace doilies and hankies, delicate fabric flowers, hand-crocheted roses, embroidery flourishes, and other bits and pieces that seem to grow right out of the pattern in the background. 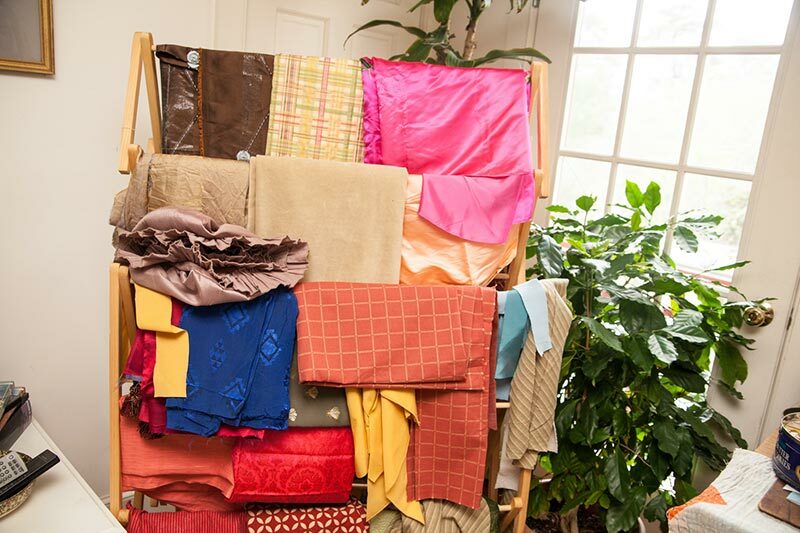 Since embarking on the pillow project, Ms. Kimberly has amassed a large collection of materials. Friends from all over have donated to the effort. She has variously acquired fabric samples from a decorator friend, lace ribbons and doilies from a woman who previously used those materials to make Victorian jewelry, and a wide variety of beautiful silk fabrics from Asia. Ms. Kimberly has also started picking things up on her own. She found a bunch of interesting fabric remnants at a store in Western Massachusetts, and she constantly scours thrift shops and rummage sales. Among her designs are some pillows made from discarded cashmere sweaters and shibori silk scarves from the Alley Cat inventory. 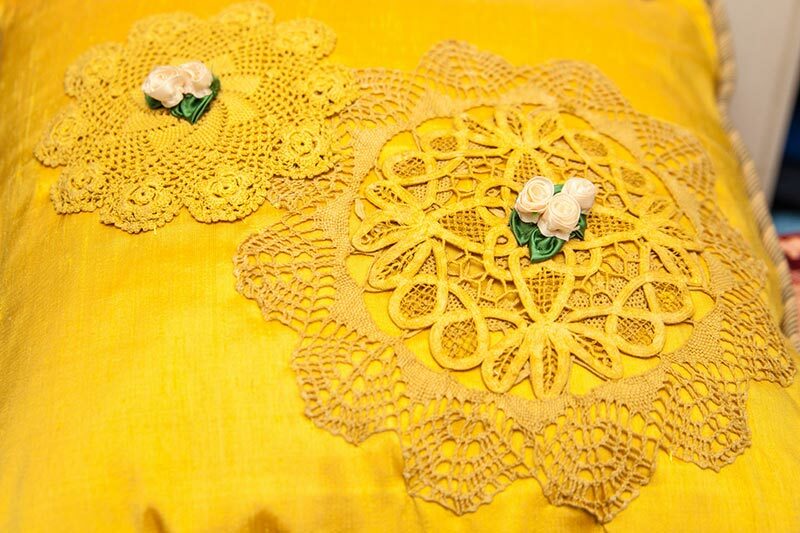 Often, Ms. Kimberly adds a personal touch, like a crocheted flower or a bit of needlework. 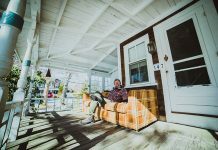 Each design grows organically. She starts with the fabric as a canvas, and then gathers appropriate materials for embellishment. 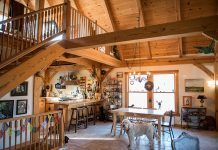 As the design takes shape, Ms. Kimberly will sometimes set it aside and then return to the work when she has an inspiration for the finishing elements. Looking through Ms. Kimberly’s stock of materials and notions, each element is beautiful and unique in its own right, and the artist truly has an eye for creative combinations. One collaged pillow features a colorful floral-design background with a dyed green doily “flower” embellished with tiny hand-stitched pink rosettes that pick up the color of the fern pattern on the fabric. Layers of lace ribbon in a variety of colors and styles complete the picture. On another, a beautiful leaf-patterned velvet scarf serves as the backdrop for a flower built up of multiple dyed doilies in pink and gold, with colored lace trim framing the image. 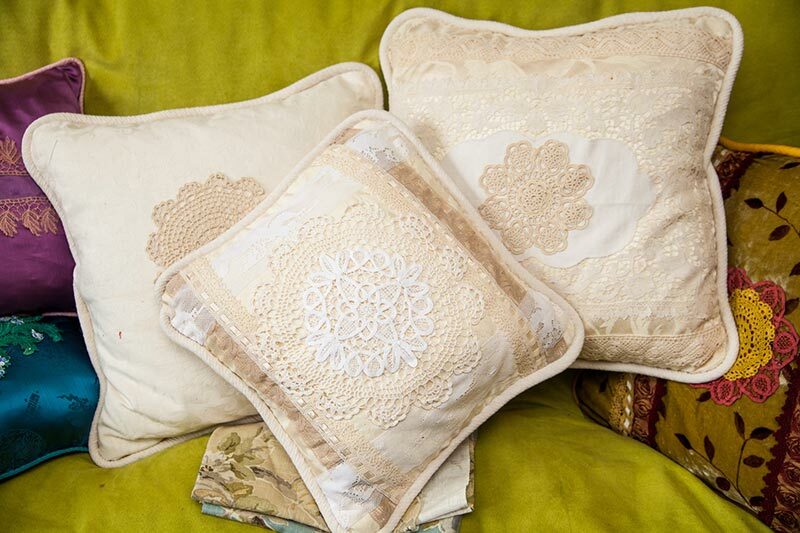 It’s the detail that really makes each pillow so interesting, and also what makes the process so labor-intensive. 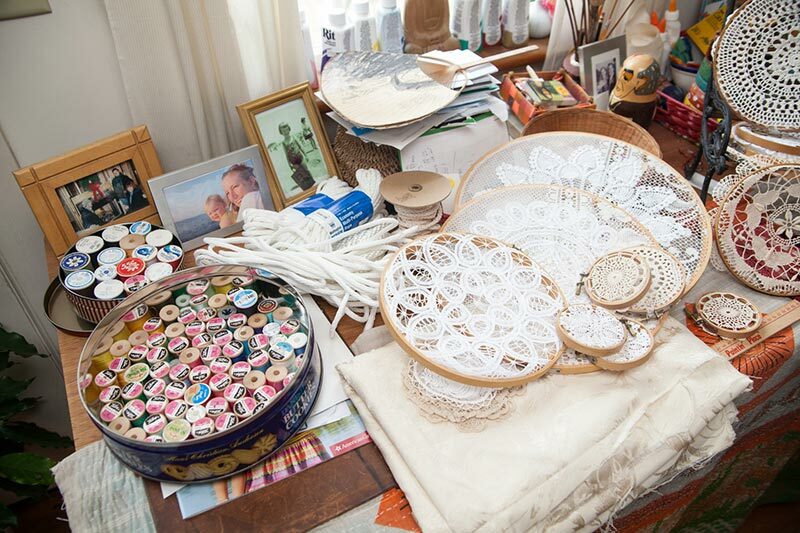 Ms. Kimberly hand-stitches everything, from the pillow seams down to the meticulous stitching-on of every point of a complex lace filigree ribbon. She custom-dyes the ribbons, doilies, and hankies to match the fabrics, and she often adds hand-crocheted pieces or embroidery touches like featherstitching and French knots. She even hand-sews the piping herself. 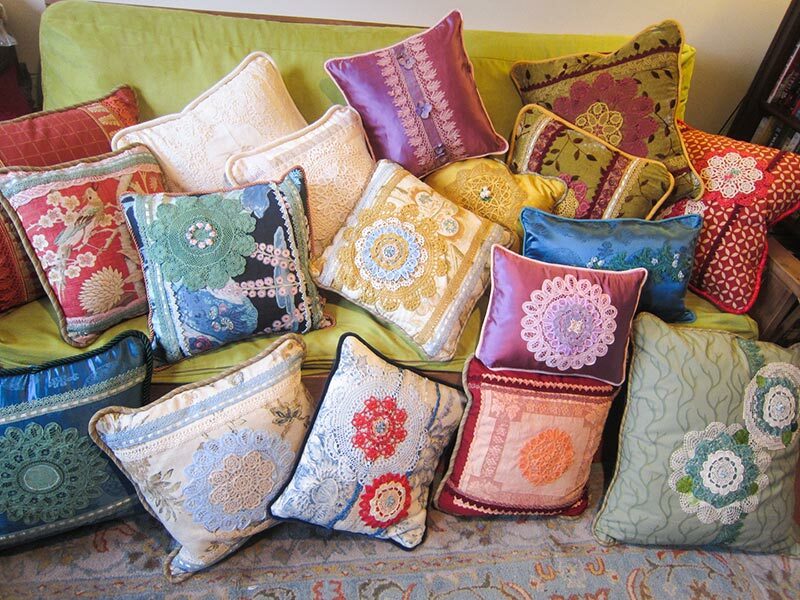 At least one interior designer has expressed interest in selling the pillows. 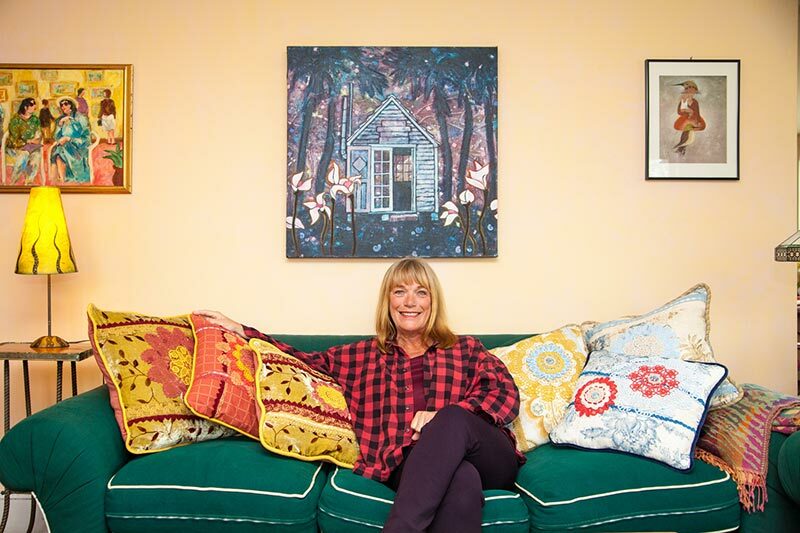 However, Ms. Kimberly prefers to sell directly to the public, partly because the labor involved sets the price at around $100 to $150 per pillow, and she doesn’t want to have to raise the price to accommodate a store or gallery’s markup. She is also looking forward to spending one day of each summer week outdoors on the beautiful grounds of Featherstone, and having some personal interaction with shoppers and other vendors. She notes that in her two decades–plus at Alley Cat, she made close friends with many of her customers.